Natural gas is currently trading at $3.53 per MMBtu. The natural gas price is recovering in the month of January after crashing in December. Lower levels of inventory are proving support. The United States and the European Union have agreed in principle in bringing U.S. LNG to Europe. China surpassed Japan as the biggest natural gas importer. Japan’s nuclear power generation is reviving again, which would curtail the LNG demand. Russia and the United States are set to fight for market share in Asia and in Europe. US preparing to become major natural gas exporter to the EU and Asia. Large Natural gas producers in the United States continue to expand production per rig. US exports are increasing significantly. The United States remains the largest petroleum and natural gas producers in the world. U.S. production is rising fast. Currently, U.S. is the third biggest exporter of natural gas. U.S. exit from Iran nuclear agreement complicates the future of vast natural gas reserves in Iran. Recently, French energy giant ‘Total’ exit lucrative Iran gas project amid sanctions. However, so far, China has filled the gaps. Europe and Russia considering energy payments in euro. Russia and Iran are likely to dominate the Chinese gas market, fastest growing in the world. With natural gas turning into a buyers’ market, big importers like Japan are renegotiating long term contracts with a resale clause attached. 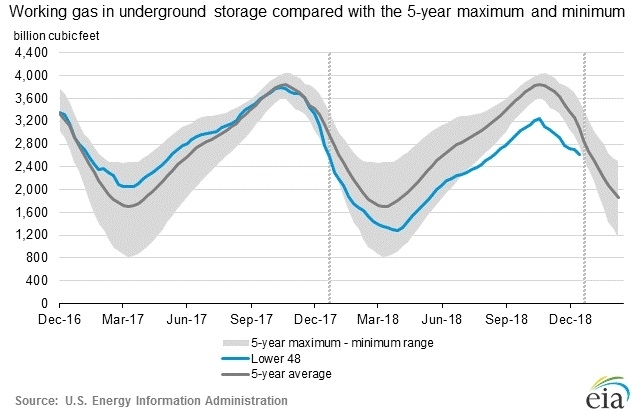 According to the latest numbers, working gas in underground storage remains at 2.614 trillion cubic feet (Tcf). Stocks are 204 Bcf less than last year at this time and 464 Bcf below the five-year average. The chart from EIA shows the level of inventory. The second chart from investing.com shows weekly changes in inventory. Last week, the inventory declined by 91 billion cubic feet against an expectation of 76 billion cubic feet decrease. Today 82 billion cubic feet draw expected. EIA will release the inventory report at 15:30 GMT.